Though Louis Vuitton's latest runway inspired mixed comparisons, the collection earned unanimous praise from sartorial critics, and deservedly so. 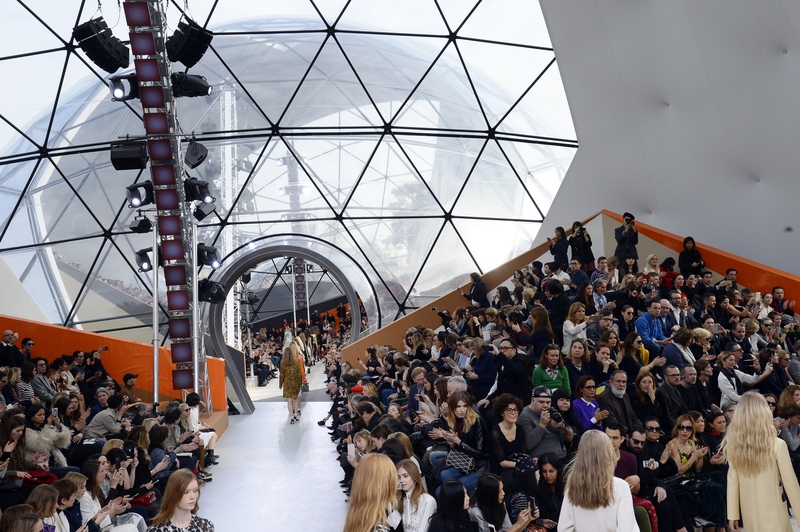 Louis Vuitton's Fall 2015 collection was by no means basic — in the patronizing usage of the word. Rather, the collection was "basic" in the fact that designer Nicolas Ghesquiere elevated elemental pieces with an idiosyncratic twist for a collection that was both forward-thinking and aesthetically pleasing — if you're the type of woman who embraces ladies-who-lunch brocade jackets mixed in with her leather, of course. Women's Wear Daily seized on the collection's preoccupation with wearable, street style garb, a thread which indeed united much of the collection, while Vogue shrewdly noted that Ghesquiere had fashioned a season of clothing that managed to "tell us what we want", finessing the high-low look into a polished science. Indeed, kicky cropped jackets and trim leather miniskirts seemed entirely street-style appropriate, and one black and white printed frock in particular satisfied the millennial need for throw-on-and-go pieces that are both visually intriguing and versatile. For its part, Fashionista gleaned that the collection is prescient in its innovative tailoring and cuts, which thankfully stop just short of appearing completely unflattering on anyone who doesn't measure in at six feet tall and 100 pounds. True to the publication's deduction, the fitted trousers and slightly boxy toppers are styles which will likely outstrip the skinny jeans and fitted blazers of seasons past. The collection excelled in a number of facets, but at a fundamental level called out to the desire of Millennials to concentrate on thoughtfully crafted clothing instead of the theatrics. Show-goers and social media followers occasionally appreciate a twisted presentation with blaring speakers, moody lighting, and some sort of flash mob-esque performance piece, but when the glitter has settled consumers need a collection they can wear in their everyday lives. In this way, Ghesquiere stripped his show down to the nuts and bolts and dreamed up clothing nearly every woman could enjoy, whether she runs a multinational corporation and waterskis on the weekends or runs a blog out of her home office, toddler in tow.